Great mix of flavors & textures! We are crazy for this Curried Quinoa Salad! It’s colorful, flavorful without a strong taste of curry, and has a balanced mix of flavors & textures including a little crunch. It works great alongside just about any veggie or protein. Best part is it’s easy to make and can be made ahead of time, so perfect for meal prep or entertaining a crowd. The recipe is adapted from Ina Garten’s Curried Couscous Salad, and it works beautifully with quinoa. 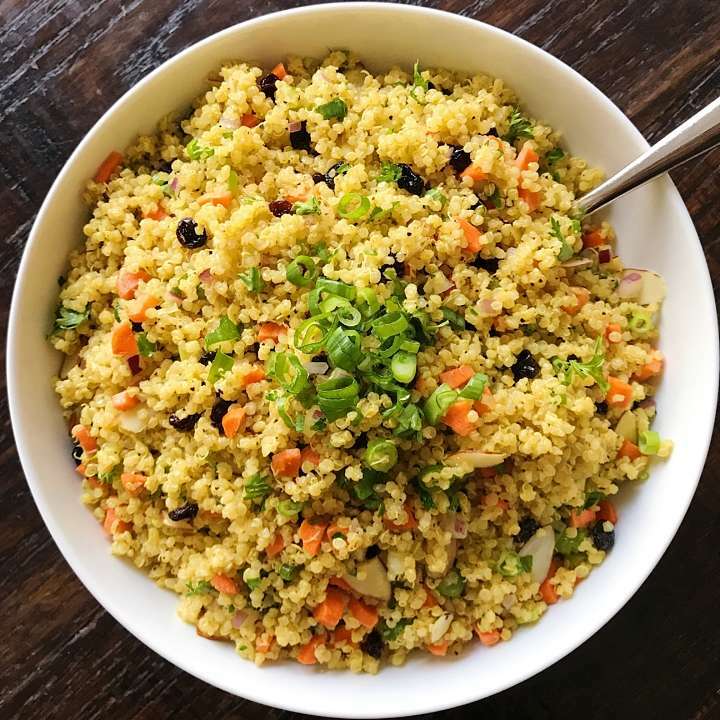 The details….Cooked quinoa tossed with finely minced carrots, red onion, currents, parsley, scallions and sliced almonds all mixed with a simple & subtle curry vinaigrette. This colorful, flavorful and easy side dish is perfect alongside any protein. The curry flavor is subtle and the salad has a balanced mix of flavors & textures including a little crunch. Best part is it's easy to make and can be made ahead of time, so perfect for meal prep or if you're entertaining a crowd. Recipe adapted from Ina Garten's Curried Couscous Salad. In a medium saucepan, place quinoa and water. Bring to a boil. Once boiling, turn heat to simmer, cover and let simmer for 15 minutes or until water is absorbed. Once water is absorbed, turn off heat and let cool briefly. Fluff with fork before using. Note: once cooked, it will be just over 4 cups of quinoa. Meanwhile, whisk together dressing ingredients until well combined (it will be a creamy slightly yellow color) and set aside. Place 4 cups of cooled quinoa in a large bowl (you may have a little plain quinoa left over) Pour dressing over quinoa and mix well a large slotted spoon or a fork. Add the carrots, parsley, currants, almonds, scallions, and red onions, toss together. Taste and add more salt and pepper as desired. Serve immediately or store in a sealed container in the refrigerator. Best in the first 24 hours if serving to a crowd but saves well for a few days.